We're all about connecting fathers with their children, heart to heart—and we know that it's doubly important for fathers who are incarcerated. Research shows that incarcerated fathers who reconnect with their children and family prior to release are less likely to go back. That's good for families...and for our nation. Recently, Salinas Valley State Prison had an event where fathers, daughters and sons came together for a week-long camp, making murals, family crests and coming up with skits to present to each other on July 28. Salinas Valley State Prison, through The GEO Group, runs National Fatherhood Initiative's InsideOut Dad® Program. Read on to learn about this touching event. This article originally appeared on Soledad Bee on August 3, 2017. Re-posted with permission. 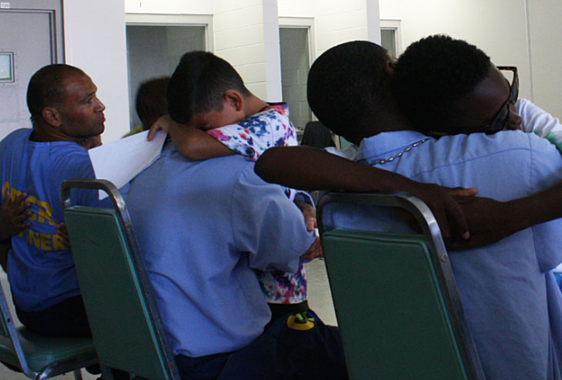 Camp Grace took place over the course of a week, July 24 to 28, when incarcerated fathers and their children got to interact. According to Place4Grace Program Director Sutina Green, similar camps have occurred at Calipatria State Prison and High Desert State Prison. This marks the first Camp Grace at Salinas Valley State Prison in Soledad. The fathers and kids even had a “dance off.” According to Headlin, the dance-off broke the ice with the other families and got to know each other better. Daughter Angela’s favorite part was the mural project of the “best day with dad". Their mural was of the two of them, father and daughter, sitting on the couch eating pizza and watching TV, possibly a Raiders game. Approximately 10 fathers participated in Camp Grace with their kids, including Kamorrie Randle, who created a mural with his son Jackson about playing basketball. The mural took three days. “First he came up with star gazing and he did a little sketch of star gazing, but he changed it in a split second,” Randle said. “This is a blessing right here. It’s amazing to spend five days with your kids. Randle said he was sentenced to life and is participating in programs to give back to the community and let them know that he is ready for change. Jackson said he actually got to play catch with his dad and that it was a really exciting week. The final day of the camp, July 28, the kids did a dance and sang along with “See You Again” by Wiz Khalifa featuring Charlie Puth, during which the youth changed the lyrics to “It’s been a long day without you my dad.” The singing made not only the fathers emotional, but also their children, such as Taniya Ellis and her brother. I am a daddy’s girl since day one,” Taniya Ellis said. Taniya said her father Rudy Ellis was gone when she was 2 years old, and the last time she saw him was on her birthday. It especially meant a lot to Taniya to be able to say to her dad that she would see him tomorrow because that doesn’t happen a lot. Salinas Valley State Prison is a general population yard and, according to Green, the races don’t usually intermix with each other. But, through the program the fathers were able to befriend each other. All the fathers have been discipline-free for at least a year, which is a criterion for Camp Grace. Looking for a simple resource that helps connect dad with his children and family prior to release? Learn more about the InsideOut Dad® Guide to Family Ties. No training or facilitator required!